Our B&B overlooks Saint Mark's Square, from the balcony of the portego (the place in the bed & breakfast where we serve breakfast) you can appreciate Saint Mark and the bell tower of the Basilica, the Palazzo Ducale, the Punta della Dogana, the Grand Canal, the Giudecca Canal and the island of San Giorgio. 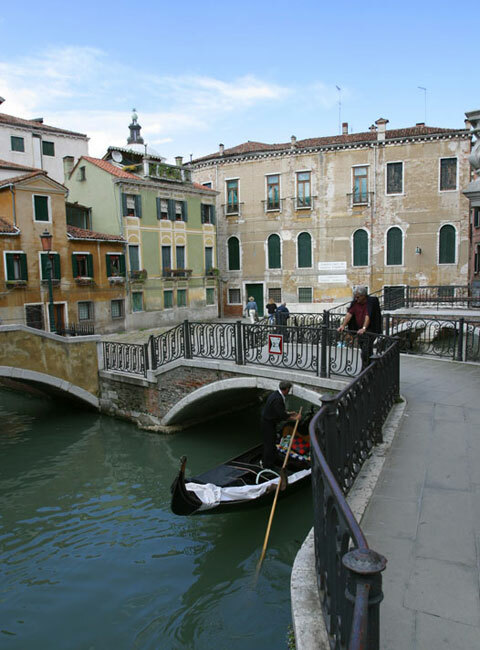 We command one of the most attractive views of Venice, and the gorgeous spectacle is truly astonishing to our guests as it is for all of us at the La Rosa dei Venti Bed and Breakfast! La Rosa dei Venti is next to the Historic Naval Museum, and a minute walk from the bed and breakfast you will find the Corderie dell'Arsenale, another venue for the Venice Biennale (The Giardini are only a stop away by vaporetto or a 10-minute walk), as is the Arsenale stop of the Alilaguna motorboat for the airport or the vaporetto of ACTV line 1, that travels along the Grand Canal throughout all of Venice. In 3 minutes the vaporetto gets you to the San Zaccaria stop, the nearest to Saint Mark's Square (takes a quarter-hour stroll from the B&B La Rosa dei Venti), and takes 12 minutes to reach the Lido of Venice, the beach of Venice where La Rosa dei Venti has beach lounging beds and umbrellas reserved for its guests. At the Lido, every year in the month of September the famous Film Festival attracts directors, actors and critics from all over the world to Venice. With Line 4.1, from the Arsenale stop, in 48 minutes you reach Murano, the famous Venetian island known the world over for its glass artisan work. The areas surrounding the B&B are truly delightful. This is an area little frequented by the tourists that usually concentrate on Saint Mark's Square and the Rialto. From the bank, the narrow streets and alleys lead to via Garibaldi and the heart of Castello (the neighborhood in Venice where the Bed and Breakfast La Rosa dei Venti is located), where one can experience the authentic Venetian atmosphere, as well as to the Arsenale, once the seat of the naval power of the Serenissima Repubblica di Venezia. You will find here bacari (typical Venice inns), coffee shops, stores, pizzerias and restaurants where you can try authentic Venetian cuisine and indulge shopping for authentic and sought-after souvenirs. If you can't read PDF documents, download Acrobat Reader. 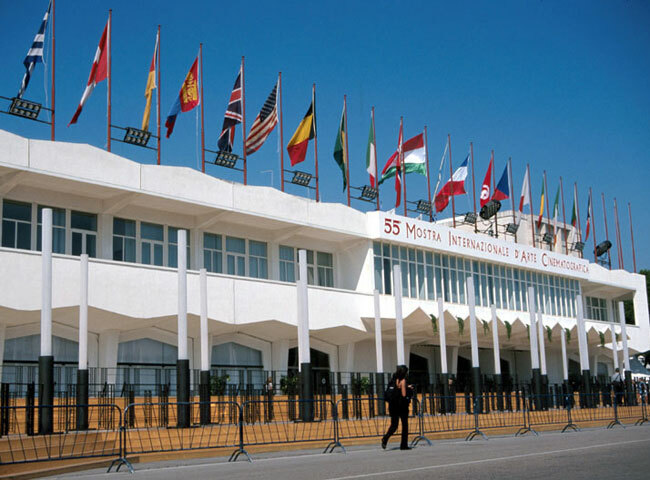 If you are coming from the Treviso airport of Canova, take the bus shuttle for Venice and get off at the terminal (Piazzale Roma), from here follow directions as in the "By car/Piazzale Roma" paragraph. 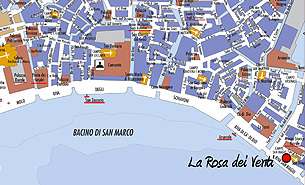 If you are coming from the Venice airport of Marco Polo, you can take a bus shuttle or ACTV Line 5) for Venice and get off at Piazzale Roma and follow directions as in the "By car /Piazzale Roma" paragraph. 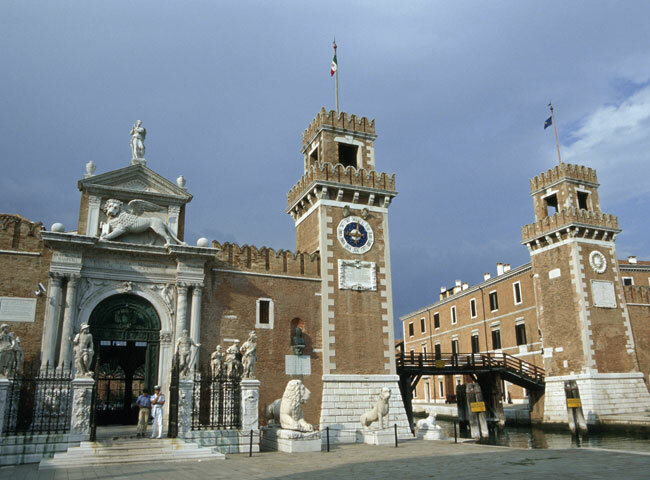 Or take the Alilaguna blue line motorboat from the wharf of the airport and get off at the Arsenale stop (around one hour travel) and continue as in "By car / Arsenale". 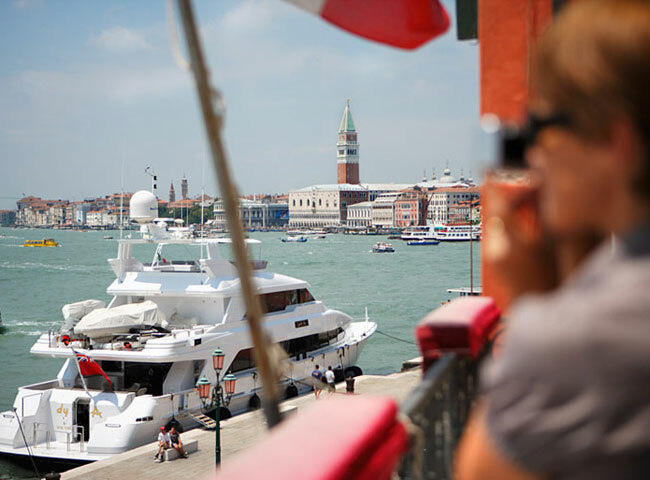 Take the vaporetto ACTV line 1 for the Lido of Venice on the fondamenta in front of the Santa Lucia train station and get off after 45 minutes at the Arsenale stop. From here continue as per "By car / Arsenale" directions. If you are coming by car, you may ask for parking reservations at the B&B La Rosa dei Venti reception desk. Come by car up to Piazzale Roma (the car and bus terminal) where you will find parking, or to Tronchetto (the island on the right just after the Ponte della Libertà bridge connecting Venice to the mainland). 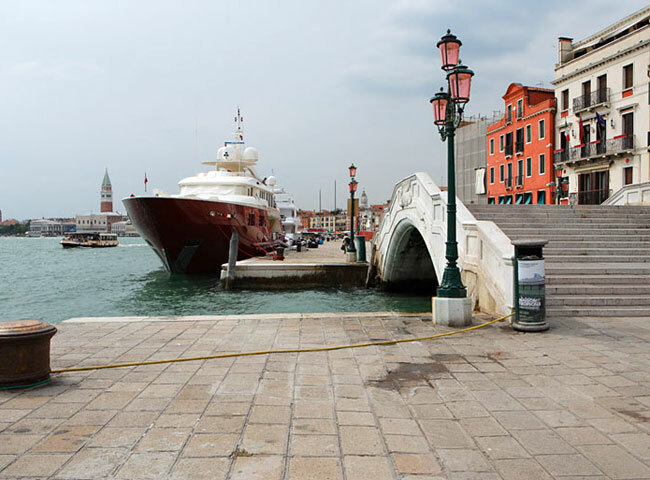 After parking, if you are in Tronchetto, take vaporetto ACTV line 2 and get to Piazzale Roma, from here continue with vaporetto ACTV line 1 for the Lido of Venice (also line 4.1). 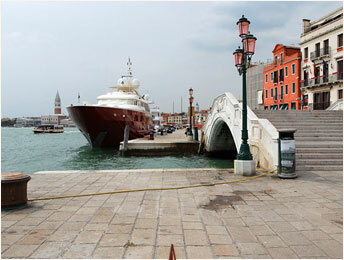 Get off after 45 minutes navigation, at the Arsenale stop. From the landing jetty (behind the stop) walk along the bank on the right, cross the bridge and you will have arrived: Rosa dei Venti is to your left at number 2143 of Riva San Biasio.